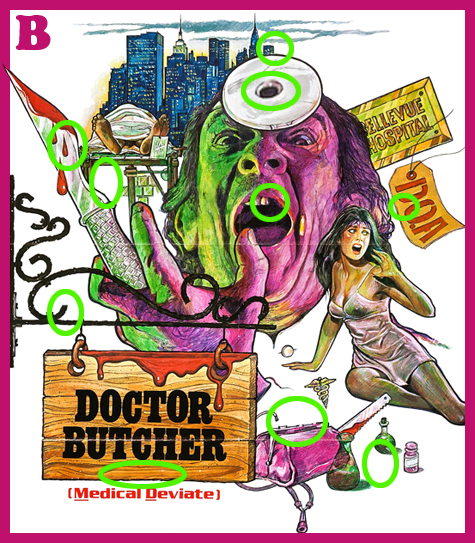 Spot the Difference:: Doctor Butcher M.D. There are ten differences between the image above (A) and the image below (B). How many can you find? 1 B Three drops vs two drops of blood. 2 B has missing brace on corpse table. 3 B Doctors head mirror has slightly larger hole. 4 B Missing MD from wooden sign. 5 B Missing handle from medical bag. 6 B Under woman’s knee pills? are missing. 7 B Metal railing holding up sign is shorter than A. Look over the D in the Wooden sign. 8 B has an extra building over the doctors head mirror. 9 B Man is missing far right tooth. 10 Dot in pic B DOA is missing. D.O.A vs DO.A. Great Job! here are the answers! Hope everybody has a great weekend!